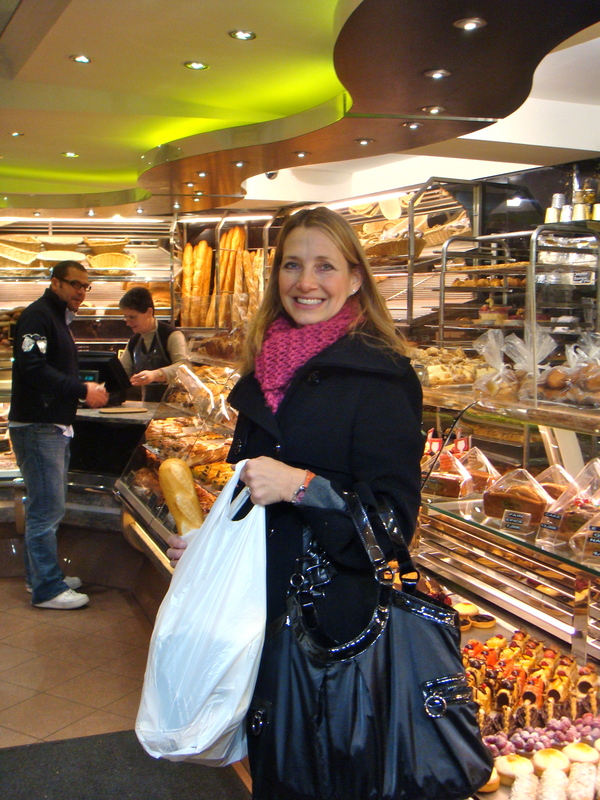 Subee at Boulangerie Carton in Paris (stocking up on jambon/fromage baguette sandwiches and other treats for the flight home). Subee, aka Susan B. Walter, is a well-fed but time-starved cook, gardener, recipe developer, writer, photographer and mom. She has been cooking and baking since she was a kid growing up in Washington state, but didn’t fully realize her passion for food until she moved to Paris after college. Living there for two years taught her that good food doesn’t have to be complicated, and that chocolate croissants can be part of a balanced diet. After business school and a decade working in brand management (more chocolate! ), Subee embarked on a new career as at-home mom. She now shuttles two kids around West Chester, PA (effective 7/14), and cooks from scratch as much as the real world allows. She loves the challenge of creating meals that are wholesome, easy and family-friendly – in other words, recipes you’ll want to make over and over again. The best of these recipes are posted here on Subee’s Kitchen. Subee reads (and appreciates!) all comments posted on the blog, and will make every effort to reply to questions. You can also contact Subee directly at subeeskitchen[at]gmail.com. The cranberry sauce recipe sounds delicious! I love your approach to keeping Thanksgiving recipes so simple and classic. Can’t wait to read future posts! I also endorse your approach to Thanksgiving! Who wants to look at disappointed faces across the table? I made Marbled Pumpkin Cheesecake… once. on my way to buy a butternut squash! your recipes never fail me! congratulations….. Happy to have finally made my way to your blog. Love it and looking forward to my next shopping list. I haven’t said that in a while. Congrats! Your blog is terrific! So many tempting (and brilliant) ideas. Until Sara explained your business card, I didn’t realize I could tap into your treasure trove of good ideas via the web.. I agree with you (heartily) about birthdays…and am thrilled to see pictures of your recent trip. Our tiny Paris apartment was right above the market near where you bought cheese…so your account made us eager to return! But first there are several receipes I’m eager to try,….starting with the corn chowder. More, soon! I too worked at a Baskin Robbins, Port Washington, NY, in high school. Of course I tried every 31wondelful+ flavor, put on some unwanted pounds, and still have fond, mouthwatering memories of pumpkin pie ice cream at halloween, and peppermint stick at Christmas time. Then, I also traveled Europe in college, and remember sweetly my 1st gelato…hazelnut, in Florence, Italy. I’ll never forget how absolutely delicious it was! More recently, around 10 years ago, I meet my friend’s husband who went to high school in my home town, but what drew me to him was his work. He started Ciao Bella, a gelato company. I found him fascinating. Like me, he loved gelato. More importantly, to work at something you love is something special. He put in years of hard work building the business, then sold it. Guess where he landed now…SaraBeth’s Kitchen. Another perfectly yummy company! Sue, you’ve found your passion… cooking, and you’re spreading the good word to your bloggers. I say “Amen” to that! I also love reading your blog… you know me and my behind the times way of thinking – hard to get me to sit on a computer for long, unless it is work related! But your blog is stellar! I love the way you incorporate photos into all of your recipes. The visuals are mouth watering. I know where to go when I am ready to make something “new”. as promised, here I am, I love this, you are a women after my own heart. Anybody who knows me knows I am not what someone would call a “great cook”however, I am,however, surrounded by great eaters. My son LOVES RIBS, my daughter LOVES to cook, that being said I will be visiting your page quite often! The visuals are terrific. Your blog ROCKS !!!! I found out about you through Houzz and your spectacular yet timeless and tasteful kitchen renovation. I’m so glad to learn more about you! Thank you! Come back and visit soon. Hi – Thanks for checking out the Kitchen! Our flooring is fir (which is naturally reddish, but it’s stained in MinWax Puritan Pine), because we were trying to match the rest of the 100-yr-old house. However, I don’t think I would recommend it unless you too have an open floor plan and are trying to match existing flooring. It is VERY soft. Good luck with your project! Thanks for your help. Looking forward to trying your recipes and keeping up with your blog. Have a good one! Hi Tya – I love my marble countertop and haven’t had any issues with staining. I do have quite a few etching spots, though. (It happens instantly upon contact with acids such as lemon juice, vinegar, OJ, etc.) These are only visible if you’re looking for them, and they don’t bother me. But you should be aware of the issue. If you’re set on white marble but are nervous about your other kitchen users, you could look into a product/application called ClearStone (clearstoneusa.com) They claim it protects marble from stains and etching for up to 15 years. I’m intrigued by it, but would be nervous to affect the natural “feel” of my marble slab. Hope this helps! Thanks, Hollye. Why don’t you send me an email at susanbwalter[at]gmail.com and we can talk about it. Mine are taupe/antique beige. If you’re in doubt you should order a sample. Antique beige is more yellow-toned. Thanks, Alexis! My cabinet hardware is from Restoration Hardware (ordered online). The pulls are “Bistro” (in various lengths, depending on the width of the drawer) and the pulls are Aubrey. Mine are a brushed nickel finish. I hope you enjoy your new kitchen! Hi Sue, I am so inspired by your kitchen and cooking. We are in the process of building a home and I want to put marble in my kitchen. Are your counters honed or polished? What type/brand of sealer do u use to help protect against staining? What material is on the perimeter of your kitchen? It looks different than your island. Your kitchen is stunning! The perimeters are pietra di cardoso, which is like a slate/marble combo. The counters are all honed, and were sealed w/silicone sealer upon installation 3 years ago – haven’t done anything since. No staining, but you will get etching on the marble even with a sealer. Good luck! 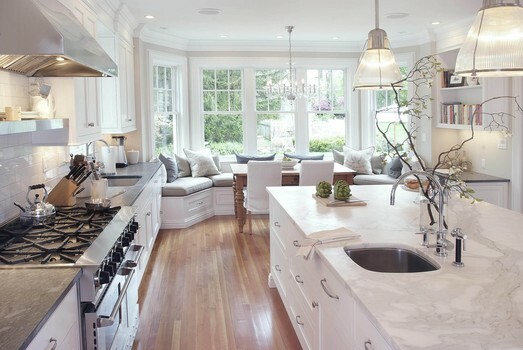 Hi Sue – I’m always a little late to the party, but I just discovered your blog through the famous houzz photo of your old kitchen. What a lot of fun I’ve had on your blog today! I cook every meal for our family, and my husband is a caterer, so we’re all about food – which brings me back to that kitchen. We’re about to embark on an addition/reno of the 70s kitchen in our Hudson Valley 1870 victorian farmhouse – and your kitchen is just what the chefs are ordering! Is there any place the floorplan of your kitchen exists? I’d love to take a look at it, or get basic dimensions if possible. Cheers to PA – I know you’ll still make food magic there – plenty of great food that way! Hi & thanks! We have not published any floorplans from the project, though you could probably piece together most of the major dimensions from various comments/replies in Houzz (and here from the Inside the Kitchen post). You could also consult with our architect, Chris Pickell. I am trying to move forward — too painful to keep rehashing details from the old kitchen. Though yes indeed — a surprising bounty for foodies here in PA! Good luck w/your project — just stick with your gut and don’t let people talk you out of what you want. Your chile verde is hands down everyone’s favorite meal once I cook it for them! Thanks for a much loved staple recipe! Thanks for the feedback, Alisa! Hi Subee, we live very close to each other- we are near Exton, PA- all good vibes! Thank you for delicious farro 🥗! Hi Neighbor! Hope to cross paths someday. PA is really growing on me!